1998 STAR WARS X-WING STARFIGHTER This detailed Hallmark ornament is a remarkable likeness to the STAR WARS X-Wing Starfighter piloted by Luke Skywalker & R2-D2 as they dashed through the galaxy. The 4 engine pods feature red glowing lights. A must for the Star Wars buff. It is mint in mint box, never used or displayed, & from a smoke free environment. Shipping- $6. I have all the Hallmark Star Wars ornaments in case you are looking for any others. 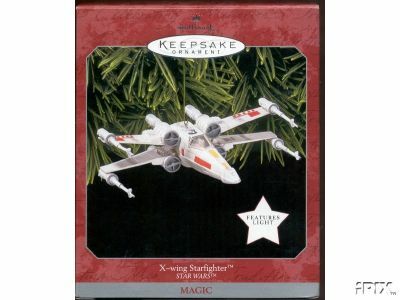 Items Similar To "X-WING Starfighter Star Wars Hallmark Ornament"